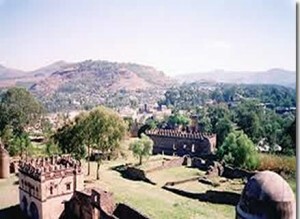 King Fasilides established the historical Gondar as the capital of Ethiopian in 1636. King Fasilides (1632-1667) diverted the temporary capital city that was established by his father, Emperor Susynos, in Gorgora. He chose Gondar because the area is free of malaria, good for defensive purpose and good climatic condition. Gondar used as the capital city of Ethiopia up to 1855 until Emperor Teodros diverted the capital. Gondar is noted for its wonderful castles on the continent Africa, arts, paintings and architecture. The castles compound (Royal enclosure) of the emperors of the first Gondarine period lies on 70000 square metre and is surrounded by twelve gates basalt wall. Historically, the first castles were built by Portuguese in Gorgora (the castle of Emperor Susynos 17th c.) and Guzera Castle (the castle of Emperor Sarsa Dengil 16th c.). However, the castles in Gondar were built by Ethiopians except Portuguese design influence. King Fasilides Castle (1632-1667) – a three sections (two stories) castle with square plan (25 m X 25m) and 32 m height. 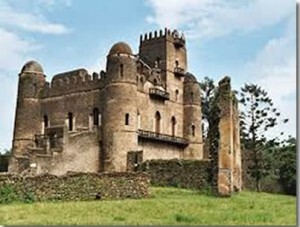 It is the most magnificent and elegant castle of Gondar. The Archive Castle – King Fasil built it for collection of documents. Yohannes Castle (1667-1682) – It is characterized as ‘love castle’ and built by Emperor Yohannes, the son of King Fasil. Emperor Iyasu I (1682-1706) – it is ‘saddle castle’. Iyasu is the son of Emperor Yohannes. Traditionally it is said this castle is as fine as the palace of King Solomon of Jerusalem. It was decorated with Vatican mirrors, gold leaf, precious materials and paintings. Unluckily, these decorations partially can not be seen because of earthquake in 1704 and the British Force bombardment to expel out the Italian Forces during the World War II. Kusquam is found at the outskirt of Gondar. Empress Mentuab built both the church and castle here. The church dedicates to St. Mary. Mahdists destroyed the original church in 19th century. The new one is also worth to visit. The skeletal remains of Empress Mentuab, Emperor Iyasu II, and her grand son Iyoas are found underground inside the church. The impressive banquet hall castle with outer wall cross relief is very interesting to visit. THe Empress also built Separate Castle for bedrooms. According to local people stroy, there is a room inside this castle where the 17th Century schotish traveler James Bruce stayed for five years. The 50 m X 30 m and 2.5 m deep, in the center of which stands the two-storied square castle is known as the bath of King Fasilides is now using as the site of Ethiopian epiphany celebration.